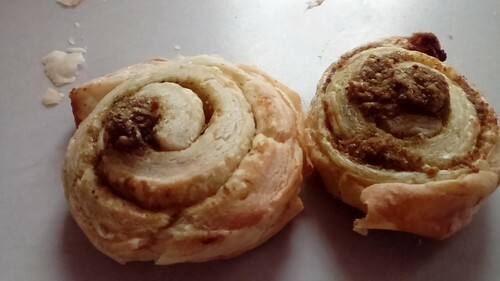 Bake More Often: Pastry is my Friend? So, given the aforementioned unreliability of the oven here, most of my baking here has been pastry based. I’ve been having all sorts of fun. One of my odder discoveries about cooking in other people’s kitchens is that people who aren’t my mother, don’t actually have catering sized colour-coded chopping boards. I thought it was just a student thing, but apparently its widespread. Well, actually colour-coded chopping boards are quite common among cooks, but apparently a decent sized chopping board is hard to find. (Unless you want one of those glass worktop savers, but I’m always afraid I’ll break those.) I didn’t realised how used I’d got to the size of the big white board my mum uses for baking, until I came to try and roll pastry on a normal size one. My goodness it’s awkward. (The very cute but truly tiny rolling pin I have, doesn’t actually help, no matter how fond of it I am.) I manage, but, well that was an unexpected addition to the xmas list, I must say! Pesto Pastry Puffs have become a new favourite of mine. They’re techinically canapés and intended to be made with either tapenade or sundried tomatoes – except that I don’t particularly like either of those things. The first time I made them I had a visiting gran. I’d planned to make veggie sausage rolls for lunch for my visitors but it turned out they weren’t arriving until mid-afternoon so lunch wouldn’t be required. I’d intended to bake and then hadn’t got round to it. I needed something quick and simple to knock up, that I could serve them with tea. Flicking through one of my recipe book I came across the recipe for chaussons aux pommes (which I’ll talk about in another post) but dismissed them due to a lack of apples. But beside that recipe, in its notes it offered a suggestion for using up the left over scraps of puff pastry from that recipe. And lo, I did in fact have some defrosted puff pastry sitting in the fridge from when I hadn’t made sausage rolls. Essentially, you take your pastry, roll it out thin into a rectangle, slather it in filling (in my case pesto, picked because I had an open jar in the fridge and I figured that people use it interchangeably with sun-dried tomatoes in pasta), roll the pastry lengthways like a swiss roll, chop the roll into 1cm wide circles, place flat on a baking tray and bung in the oven for 20 minutes. Serve warm. Quick, simple, tasty. 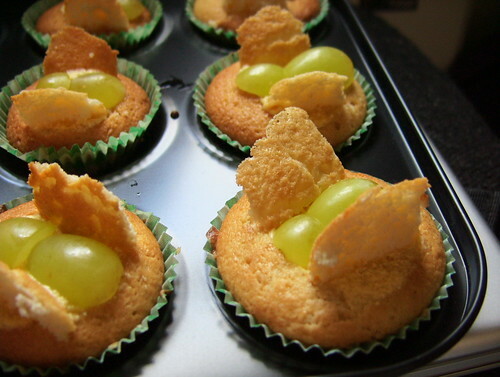 Perfect canapés – they went down a treat. 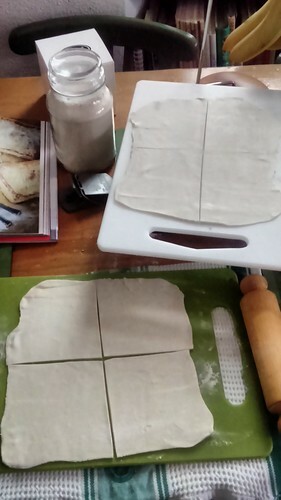 I did get round to making my sausage rolls – well, I had the veggie sausages and the rest of pastry all defrosted and waiting, it would have been a shame to waste it – later in the week. I actually miss very little foodwise, being a vegetarian, but sausages are a big one. Finding a good veggie sausage is problematic but it turns out that the one thing that made veggie sausages endlessly consumable to me is turning them into sausage rolls. I love sausage rolls, especially home-made ones – in fact, long before I became a vegetarian I knew a girl who made amazing sausage rolls and her own sausages to go in them, her veggie sausage rolls were glorious. While I can only aspire to veggie sausages that can compare to Bobbie’s I’m really quite pleased with how mine turned out. (They only exploded a little tiny bit!) This is far and away my favourite way to eat veggie sausages. Over a year ago, when I was attempting to cook up my cupboards ahead of moving house, I made a supplementary list of recipes that eventually was amalgamated with the ’30 Recipes’ list. Partly because certain recipe books were in the wrong cities and also because when I originally compiled the recipe I ate meat and these days I’m a vegetarian. I’ve talked before about my recipe book ‘problem’ that these lists were an attempt to curb. Being back in Inverness, I once again had access to the Dal Cookbook that I obsessed about last year. (And despite my myriad plans made nothing from…) Since then I’ve made two recipes from the book – Lentil Kutu with Green Beans and Moong Dal with Cauliflower – so it seemed sensible to write about them together. They actually had a few things in common. For a start they both turned out to be different versions of recipes that I’d cooked before. In the case of the Lentil Kutu an inferior version and in the case of the Moong Dal with Cauliflower a far superior version. One of the disappointing aspects of the book was that many of the recipes followed essentially the same pattern. Cook lentils, cook vegetables, grind spice and fry them in oil, combine veg and lentil, pour spiced oil over the mixture and serve. I much prefer the lentils to be cooked together with the spices (even if that does sometimes involve counting in and out the cardamom pods), as I prefer the way the flavours disperse through the lentils. I feel it gives a richer and mellower flavour. Lentil Kutu with Green Beans sounded like it would be amazing but ended up being really messy to cook and frankly a bit disappointing. Strangely, when I was eating it I thought, I’ve made something really similar to this before and it was much better. But having retrieved the book I thought it was in, I can find no dals involving green beans. (No green beans at all.) 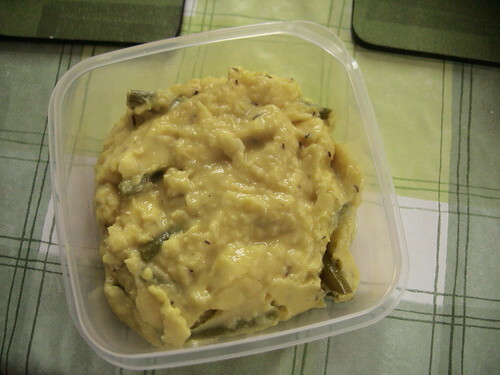 I can only presume that I made another similar dal that was meant to use another vegetable entirely, but I used green beans for it because that’s what I had to hand. Which doesn’t help me in the slightest to narrow it down and find the preferred recipe. Moong Dal with Cauliflower, is clearly the dish that the Lentil and Cauliflower Curry, which I found in my mum’s Oxo cookbook, was based on. The flavours are much nicer (and obviously more authentic) though for reasons of preferred spice frying techniques, I may well cobble together a recipe that is a combination of them both for future use. Lentils and cauliflower make for such cheap and tasty bulk curry cooking. Over the last year and a half, I’ve lived in three different places, which has meant three different kitchens. One of those was my parent’s kitchen, which is familiar but having been away seemed strange and new again last winter. I adored the kitchen in my old flat. It was big and between my flatmates and me we basically had everything culinary we could possibly need (and a few things we didn’t). One of my flatmates was as keen a cook as me and the kitchen became the main social space of our flat. The weekend that I moved in there were home made brownies and I never had a chance to get nervous about cooking in this kitchen because someone else was already experimenting. There were successes and disasters and not a little heckling. My current kitchen is different. It’s small and perfectly formed but it’s not mine. I’m a lodger and however well that situation has worked out, I’m always aware that this is someone else’s kitchen. It’s exacerbated by the fact that my landlady isn’t much for cooking herself. She doesn’t bake at all. I already spent much more time in the kitchen than she does just making dinner and preparing packed lunches. So for months I chickened out of baking. After my excellent start to my Bake More Often challenge in the first three months of the year, I didn’t bake again for another three months. Then I discovered that neither did my landlady. In fact the extent of her baking equipment is a large bowl, a whisk, a set of scales, some wooden spoons and a bun tray. Undeterred I bought packet mix and butter, and made red velvet cupcakes. Not quite as impressive as I’d hoped but baking nonetheless. The icing was a bit of a disaster but the buns were tasty and my parents were impressed that I’d actually produced cake in this strange new kitchen. The oven has taken some getting used to. Its highest temperature is 200˚C (it’s a fan oven thankfully) and pretty much anything I ever bake in it takes at least 5 if not 10 minutes longer than the instructions say. It’s been an experience. However, I’ve persevered, as evidenced by the fact that I have another two Bake More Often posts planned for this month. (Pastry is a bit of a theme; it seems to be the most consistently successful substance to bake in this oven.) 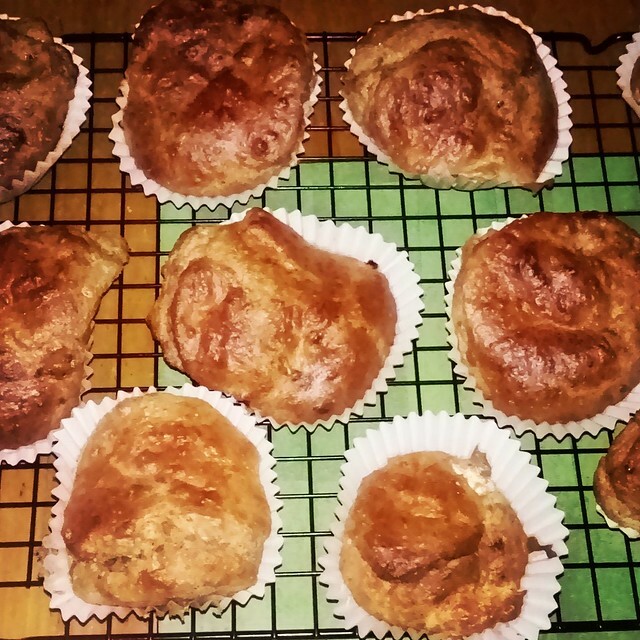 I made Banana and Peanut Butter muffins and they were…fine. 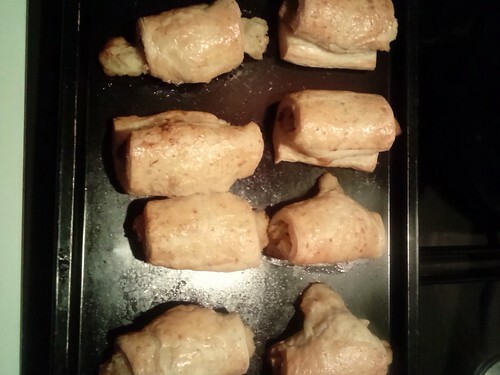 Well the recipe needs a bit of refining which doesn’t help but in the end I established that giving them a wee zap in the microwave then letting them cool down again made them quite pleasant to eat for breakfast. Given how nice they looked and smelled they were just a bit underwhelming. Sometimes when I’m cooking – or more often, when I’m planning what I’m going to cook – its easy to get caught up and make things overly complicated. Too many ingredients, too much fuss, when all I really want is something simple, filling and tasty to eat after work. Sometimes I want to cook something fancy as therapy and others I just want a full belly. Monday was one of those nights, I’d made plans for what I was going to make and thanks to a lack of one vital ingredient they were scuppered and I needed to make something else. I got caught in a loop for ages, looking for and rejecting potential recipes based on different things I had in the cupboard and fridge. Round and round I went, back and forward, making no progress as time ticked away and I got steadily hungrier. Eventually I went raiding my cupboards for something quick and easy and came across a packet of couscous. Couscous is pretty much the definition of quick and easy, but what to have with it? I raided my cookbooks for inspiration and came away with assorted ideas. Feta is a popular choice and I had some in the fridge. I’d been half-heartedly preparing some spinach for the abandoned recipe so I had a small pile of that on hand. A quick dig in the salad box unearthed some spring onions and a small pepper. I measured out the couscous and stuck it in a pot with some vegetable stock, leaving it to do its thing while I gently softened the spring onions and pepper in a little olive oil. When they were nice and soft I chucked in the spinach with a little more oil and wilted that down. Once the couscous had drunk up the stock, I crumbled in some feta into it and stuck some heat under it. I gave it a few minutes – stirring regularly – then added in the veggies and a wee twirl of lime juice. And tada. 200g of couscous, half a pack of feta (it goes lovely and melty in the couscous) and some oddments from the fridge made a filling dinner one night and the leftovers made a tasty lunch another twice. So easy and effortless. Like the Internet reached out and hugged me. I’ve known my friend Sarah for the best part of a decade now: since the days when we both lived on the south coast of England. We share an abiding love of horror movies, but food has always been our favoured method of communication. Despite having left home with a good grasp of the basics, I was a very unadventurous cook. More importantly, despite my love of planning and organisation, I’m fundamentally not a very organised person. (Most jobs I’ve ever had have involved either high levels of organisation or working to deadlines, so all my energy goes into those, leaving my personal life with a sort of Douglas Adams approach to deadlines…) So when I was living down by the sea, working on my masters’ dissertation, my organisational energies for anything that wasn’t research or writing was utterly minimal. I would get up eat breakfast, start working and get caught up, forget to have lunch and suddenly it would be dark and I’d be feeling light-headed, because it was 8 at night and I hadn’t eaten since 10 in the morning. And at the point when you’re already ravenous, that’s a really bad time to try and make sensible and healthy choices about food and what you want to eat. I ate a lot of pasta with sauce that was made from chicken soup, generally with either sausages or bell peppers. That or chicken in a cook-in sauce with rice. Unsurprisingly I got sick a lot. (I eat a lot of fruit – I suspect it’s the only reason I didn’t get scurvy as a student.) My blog from back then talks a lot about poor health and poor diet and learning to cook to combat that. At some point I borrowed one of my mum’s OXO cookbooks and diligently worked my way through that to varying degrees of success. Along the way, as I started feeling the benefits of cooking properly, I started to branch out into ingredients I wasn’t familiar with. Sarah started gently nudging me towards new and interesting foodstuffs, sharing quick and easy recipes that were tasty and simple, but felt grown-up and adventurous. (She mothered me a little, but far from home and determined I could make it on my own, I kind of needed it.) The distance between pasta and sausage and peppers in a chicken soup sauce and gnocchi and chorizo, with cherry tomatoes, in pesto is not that far, but it feels a thousand miles away. Pancetta and Parmesan and spinach and ricotta, all rolled into my repertoire and stayed there. Mostly she taught me how something a little different (that squeeze of lime juice or sprinkle of parmesan) could turn an ordinary meal into something special. Reassuring instructions and tips in the IM window as I cooked, encouraging me to be adventurous in the kitchen and somehow it was easier to be brave. I was a long way from home those days, and it was years ago, but gnocchi with cherry tomatoes and pesto is still comfort food. I’m older and wiser – I hope! – now, a vegetarian even, but I’m a long way from home again. I’ve recently discovered Instagram (I keep a food blog, no one should be surprised that I would gravitate towards a social media format stereotypically known for people photographing their food) and have been vicariously enjoying other people’s food. One of those people being Sarah. 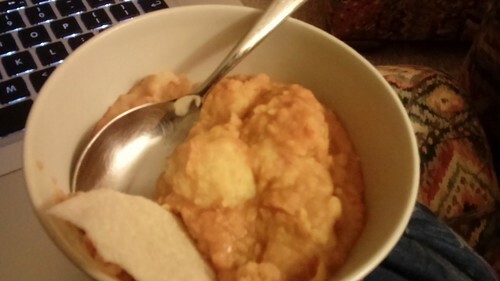 The other week she made a particularly tasty looking soup. Mussaman chicken soup. She reckoned it would be dead easy to make it veggie with lentils instead of chicken. It sounded pretty darn good and I told her so, and she responded with the recipe. I’d not been…good about cooking during September (or August really); in fact the only thing I’d been consistently making was soup. I’ve eaten a lot of broccoli and blue cheese soup but otherwise if I did a decent cook once a week I was doing well. I make grand plans about what I’m going to make, but I don’t actually make very much. If food is self-care for me, then I wasn’t doing a very good job of looking after myself. I needed to break the spell. Soup I could do, I bought the ingredients I didn’t already have – the list nestled safely on my phone as a reminder both of what I needed and that Sarah would be expecting to learn how I got on with it. One Sunday I made the soup. I even remembered to buy a nice crunchy loaf to eat it with. It was warm and aromatic. Spicy without a chilli kick of doom. I mentally made notes for future cooking, an extra five minutes for the lentils and sweet potato, perhaps a little seasonal squash (if pre-cooked) would work well in the mix, debating whether blending it would improve or weaken the soup. 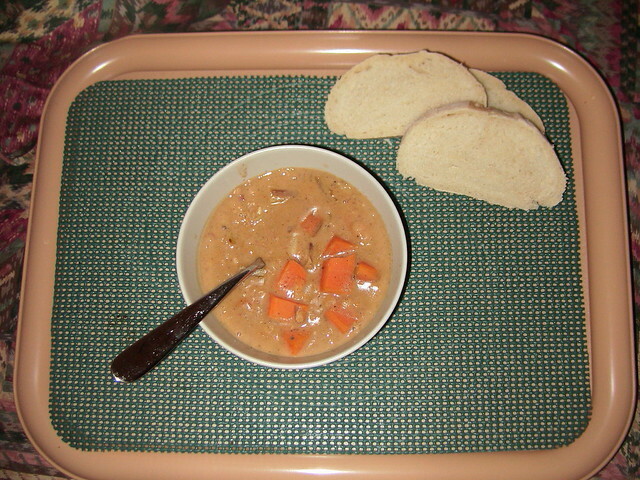 It was tasty and comforting and a bit different from anything else I’d made recently. Almost as though my friend had reached out through the Internet and given me a hug. It was, in fact, exactly what I needed. It did in fact break the spell, setting me off on all sorts of cooking adventures. Sausage rolls and pesto puffs, various curries and several different ways with apples. 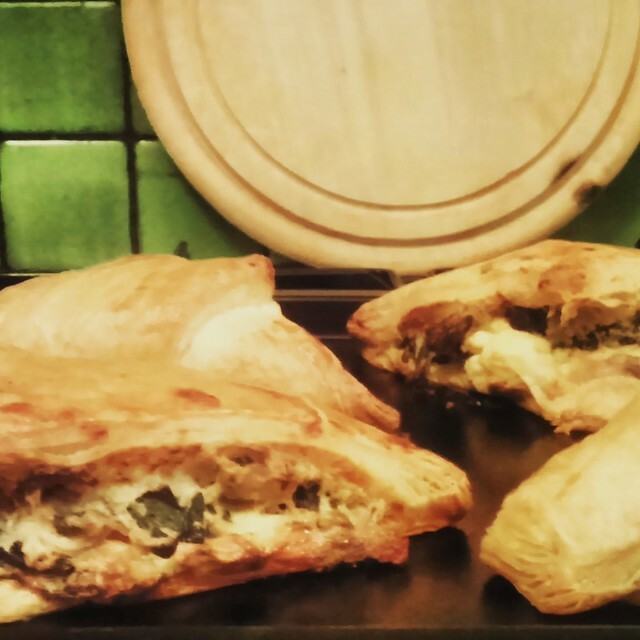 I made spanakopita from her instructions too, despite never having eaten feta cheese before, stepping into the unfamiliar territory of Greek cuisine with only an old friends reassurances that they were simple and tasty – correct in both cases. (Exploded a little but I’ll get the hang of them eventually.) I’m on a downswing again from my cooking kick of the last month or so. I feel all scatty and disorganised. But when I was searching through my cupboards and fridge for inspiration this evening, I came across the left over feta from the spanakopita and remembered to be brave. Made something simple and filling, but a little bit different.